Chunky cables are like chocolate chunks – a good thing made even better by a mere change of proportions! 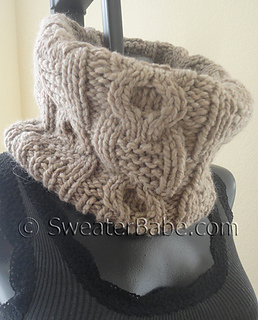 This easy-to-knit cabled cowl features a cool mix of basic cables with some garter stitch thrown in. The alternating cable panels are actually the same, but staggered to create a more interesting result. 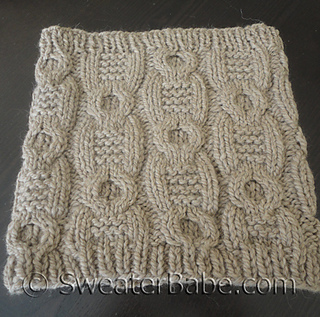 A super quick knit on size 13 circular needles, this cowl only uses 2 balls of the bulky yarn. And it’s seamless, so finishing is so fast, you’ll be able to wear it right away! 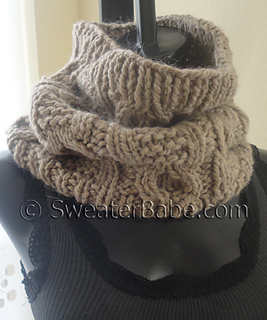 This is my new favorite, wear with everything cowl! Looks great worn slouched down or folded in more like a chunky turtleneck. A versatile pattern worthy of being knit in a few more colors to mix up any wardrobe.